Toward the end of last year, I reviewed Scott Hale’s first volume of The Garden of Enid. I compared it to the several Calvin & Hobbes treasury volumes, consisting largely of stand-alone strips with a few longer (though mostly self-contained) story arcs. The book was funny, touching, and thoughtful. 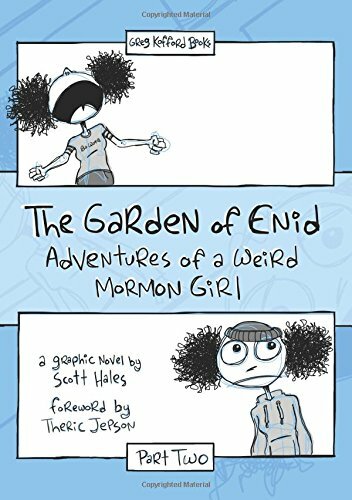 But with the release of The Garden of Enid: Adventures of a Weird Mormon Girl, Part 2 by Greg Kofford Books, Hales has taken Enid in the direction of the more familiar comics and graphic novels mentioned above. And the results are very satisfying. Naturally, Hales provides plenty of stand-alone strips. They range from the irritation of remembering it’s Fast Sunday the morning of (Enid vs. Breakfast), the annoyance of using “thee, thou, thy, thine” in prayers (Enid vs. The Thees and Thous), and even the “mind-blowing” connection between Jimmy Olsen in the Superman films and Scott in the LDS film The Phone Call (Enid vs. The Actor; by the way, he’s also Marty McFly’s brother in Back to the Future). 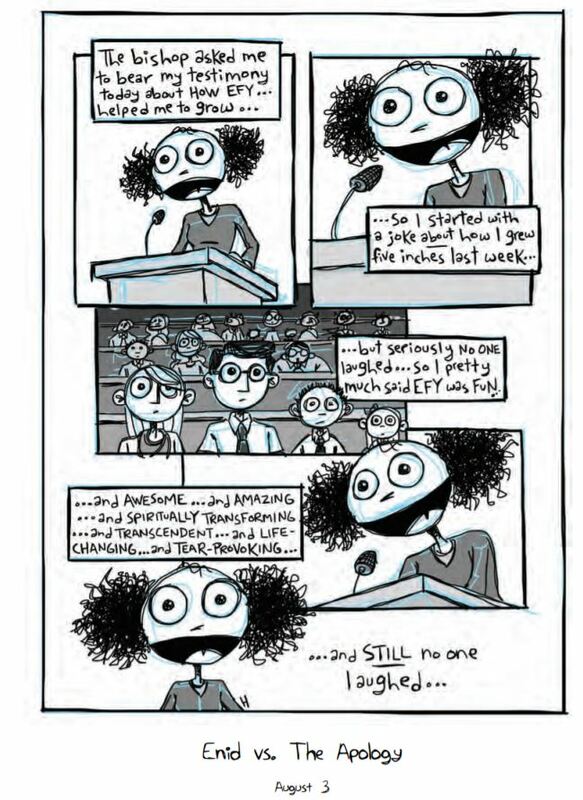 While the strips are still brimming with Enid’s quirky humor and Mormon self-deprecation, this second volume strikes me as more pensive than the last one. The longer strips in particular take the time to address important themes and issues in modern Mormonism, from cruel comments at church (Enid vs. The Messed-Up Day) to homosexuality (Enid vs. The Party). 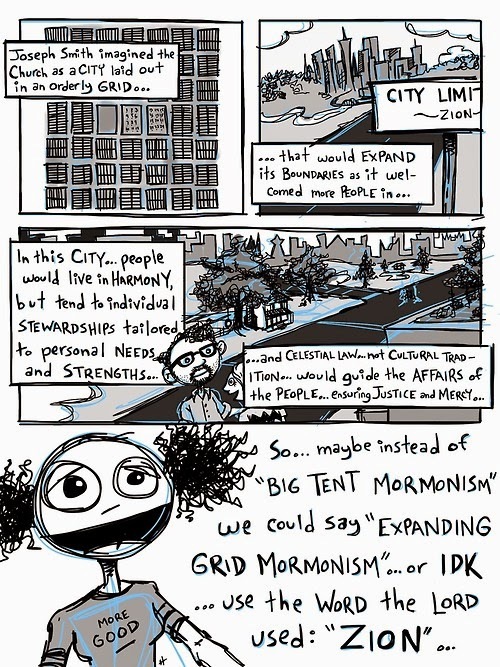 One of my favorites is Enid’s take on “Big Tent Mormonism.” In short, she’s “not a fan of the term” (Enid vs. The Big Tent). Her reasons? : even really big tents have walls, which kind of kills of the whole concept of openness. Yet borders are necessary because “borders help us define who we are in more ways than we probably realize.” Her solution? But what brought all of these together was the long story arc of Enid’s relationship with her mother and the identity of her absent father. This volume offers a more fleshed-out storyline, even opening with an allusion to her EFY heartache at the end of Part One. But more than attaching itself to the previous volume, the opening strip sets the tone and narrative for the rest of Part Two. We begin to see deeper elements of Enid’s character (including her flaws) as she establishes friendships and attempts to cope with her mom’s failing health and mysterious past. The questions she asks are harder. The situations are, for lack of a better word, messier than before: just like life. The last act (Enid vs. The Story) was not unexpected, but the realism of it (“I was just checking Twitter…”) was, in my view, theologically profound and I think far closer to what we actually experience. And the cliffhanger (along with the sheer joy of seeing Enid’s friends come through) makes me excited for Part Three. I also enjoy the work of Catholic philosopher Edward Feser whose blog posts are overrun with comic references. I remember watching the horrific seminary video Godly Sorrow on my mission and my companion commented, “That looks like the bad guy off Paycheck.” I agreed, but we decided he probably just looked similar. Turns out it was Aaron Eckhart. 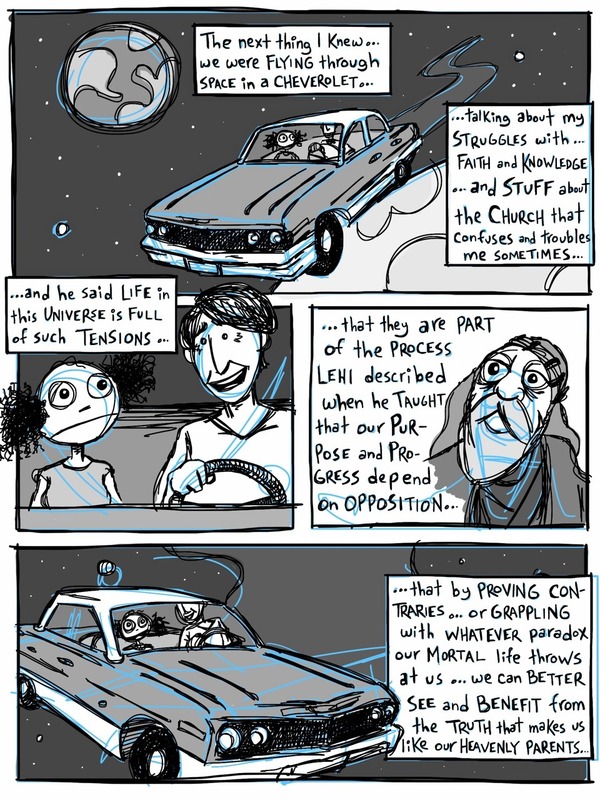 This entry was posted in Art, Book Reviews, Culture, Literature and tagged comics, Enid, Scott Hales, weirdness by Walker Wright. Bookmark the permalink.